Jesus Christ Himself declared, “He who has seen me, has seen the Father” (John 14:9). For this reason many contemporary Christian teachers teach that God is not angry and vengeful as old-school preachers used to imply, but instead He is tolerant, meek and merciful. Such teachers proclaim that Jesus Christ is perfect theology. By saying this they mean that Jesus, as presented in the Gospels of Matthew, Mark, Luke and John is a perfect and complete picture of who God is. Since we do not see Jesus judging anyone, being angry with sinners or warning anyone of hell fire, we must never picture God in such ways. In the Old Testament it is assumed that God was revealed in an imperfect and somewhat skewed way, but now Jesus has appeared to correct much of the false notions people once ignorantly held about the living God. Of course people who teach such things would not say the Old Testament was wrong about God, just that it was not a perfect picture. Now that God has been revealed in the flesh, and has shown Himself to be lenient towards sinners, easily approachable and gracious towards all, we need to let that renew our view of God. They might allow that God was angry and vengeful in the Old Testament, and in some ways still bears those traits, but they will quickly clarify that since Jesus has now paid the penalty for sin on the Cross, anger and vengeance no longer determine God’s actions. This modern theological theory might be argued, defended or presented in various ways to make it seem like both Old and New Testament Scriptures have been consulted and accepted, but at the end of the day the clear impression will be that Jesus is gentle, meek and unwilling to judge, and therefore so is God. …which is manifest evidence of the righteous judgment of God, that you may be counted worthy of the kingdom of God, for which you also suffer; since it is a righteous thing with God to repay with tribulation those who trouble you, and to give you who are troubled rest with us when the Lord Jesus is revealed from heaven with His mighty angels, in flaming fire taking vengeance on those who do not know God, and on those who do not obey the gospel of our Lord Jesus Christ. These shall be punished with everlasting destruction from the presence of the Lord and from the glory of His power, when He comes, in that Day, to be glorified in His saints and to be admired among all those who believe, because our testimony among you was believed. Of course the basic premise of such false teaching is true; Jesus Christ is God manifested in the flesh; to see Him is to see the Father. This point is in line with sound, biblical and historical Christian teaching. Nevertheless, there are two dangerous and blasphemous errors in this popular perspective that we must address and be aware of. Firstly, the Jesus Christ revealed in the Gospels of Matthew, Mark, Luke and John is not merely meek and mild. It is true that He does show the gracious character of His Father by allowing humble sinners to fall at His feet for pardon; and it is true that He is willing to approach sinners even before they repent with a conditional offer of mercy. In fact, it was this graciousness that led the Pharisees to falsely accuse Him of being a “friend of sinners.” But when we refuse to let contemporary errors influence how we read the Gospels, we will see that Jesus did not grant self-righteous or rebellious sinners any place of refuge from God’s wrath; instead He warned them in no uncertain terms that if they did not repent, they would perish in hell, where the worm does not die and the flame is not quenched. He used language that was crystal clear; He referred to hell and the torments of it more clearly than anyone else in Scripture. Yes, He came to earth and sought out sinners, but not in order to fellowship with them, for light will have no fellowship with darkness, nor Christ with rebels against His Father; He came to call sinners to repentance. The second obvious error of such teaching is that Jesus Christ only perfectly revealed the Father in His first coming. People who appeal to Jesus as perfect theology fail to realize the fact that in the Gospels Jesus is not revealing God in His divine glory, but in His humility as a man. The Gospels show us what God looks like when He sets aside His divine rights and walks as a human being. This is why Jesus is not only our Lord, but also our Example; He did not only reveal God to us, He also revealed how we are supposed to live as human beings under the authority of God. The Bible, both Old and New Testament, both in the Gospels and in the Epistles, does not only speak of Christ in His humiliation, but also in His glorification. The Bible does not only talk about His first coming during which He died for our sins as a man, but also tells us about His second coming during which He will judge us as our God! But Jesus Christ will continue to perfectly reveal God at His second coming when He judges the living and the dead. At that time we will hear the heart of God perfectly represented when He says, “Bring here those enemies of mine, who did not want me to reign over them, and slay them before me” (Luke 19:27). When He casts those who have lived in disobedience to God into the everlasting punishment of outer darkness where there is weeping and gnashing of teeth, we will see God in the flesh perfectly representing His Father. We have never considered Jesus our buddy; we have always held Him in honor as our kind Savior and our glorious King. We are eternally grateful that in mercy He has humbled Himself for our salvation, but we know He is not only our Savior, but also our Lord and Judge. 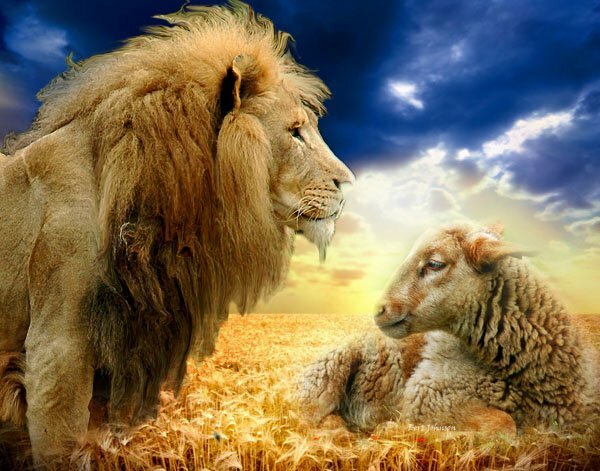 We understand He is the Lamb of God, but we also understand that He is the Lion of the tribe of Judah! We have always preached not only the first coming of Christ, but also His coming in glory at the end of the age to separate the sheep and the goats. We believe in the judgment to come and we believe that Jesus will be the One doing the judging in the name of His Father. We must not allow the false Christian teaching of our day, no matter how popular, to sway us from our biblical heritage. We do not believe in a tame and domesticated Jesus, but in a Jesus that is every bit as dangerous as His Father!